I have a new planner for 2015, which kind of surprises me. I was very happy in my Filofax Flex, and used it for a number of months (wow, from May to December 2014, which is something of a record for me). I had no plans to change but I found myself in December with no calendar drawn for January. December was super busy, more so than normal, and I really needed a January calendar to record things but couldn’t find the time to draw one. I grabbed an undated planner and used that for a couple of weeks (similar to the Toffeenut Planner) but then I found myself with a gift card in Reid’s Stationers. And they had a personal Finsbury Filofax in Raspberry, and well, I was sold. 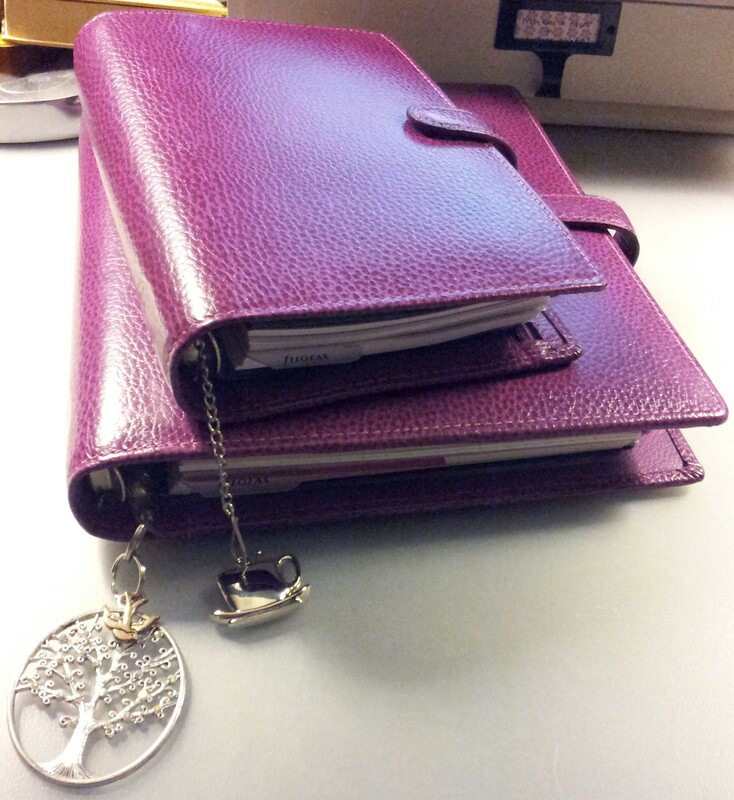 Obviously I like this style, as I already have a Filofax Finsbury in Raspberry in the A5 size, which I reviewed here. 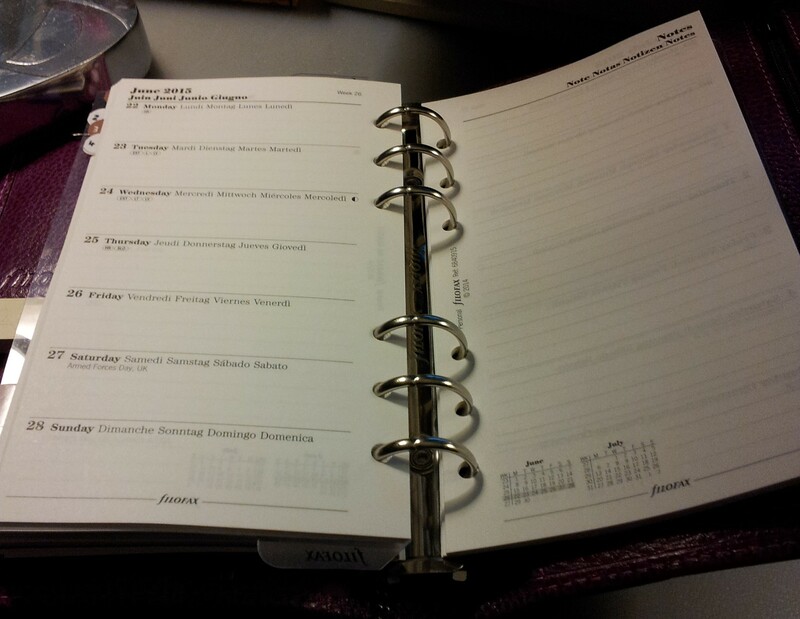 And I did consider using the A5 as my everyday planner, but it is heavy and I’ve been trying to cut down on the weight in my purse of late, so I was thrilled to find the same binder in the Personal size. The Personal is much easier to carry around. And it was a bargain at $66. In this picture it’s laying flat because of the silver paperweight in the upper left corner. Otherwise it would lie about half open. Anyway the inside of each is laid out in a similar fashion. 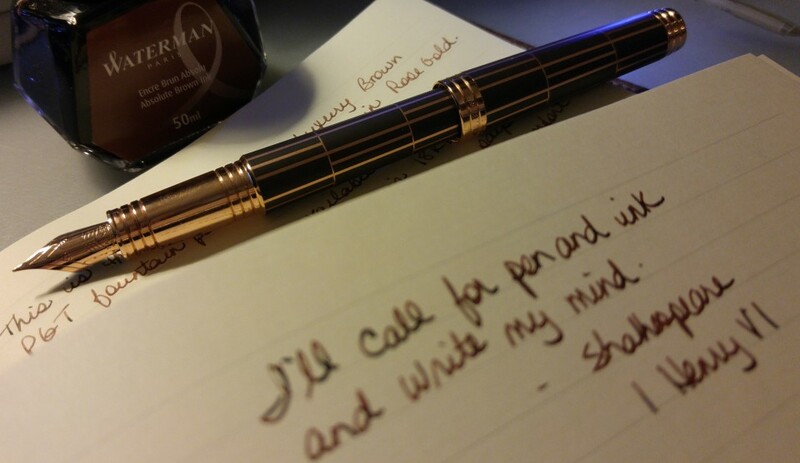 The pen loops are tight but I had no problem with my Pilot G-TEC C4. And I keep my Pilot Coleto 5 barrel tucked into the rings. I created a plastic dashboard out of the packaging and keep it at the front to protect the pages. Sorry for the glare! I don’t like to stuff my planners so I just keep a couple post-it notes, flags, paper clips and a single sheet of calendar stickers. The planner didn’t come with monthly pages and I find it hard to get by without them, so I was back to drawing boxes! 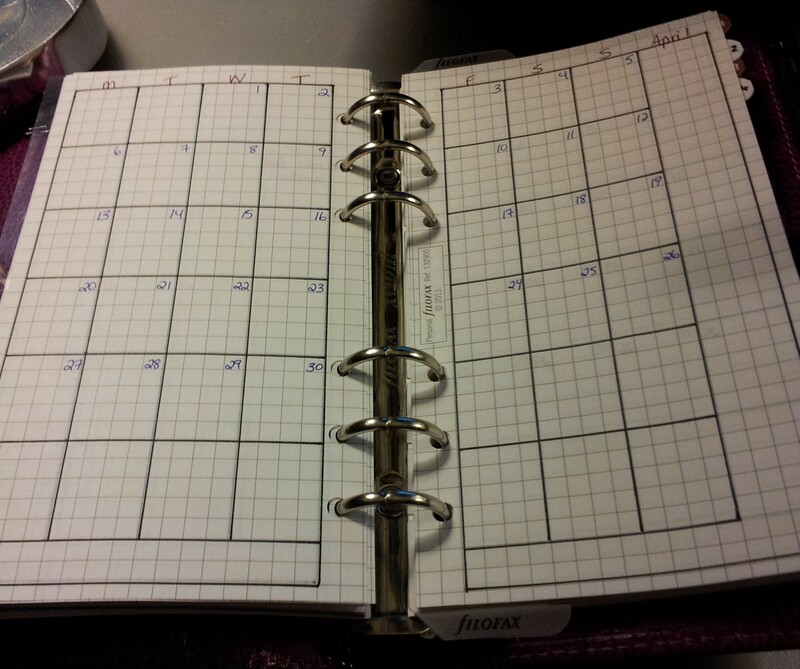 But at least I could draw them on graph paper, which did come with the planner. The week on 2 pages format comes standard but I wanted this one, with the week on the left and a generous space for notes on the right. The lovely folks at Reid’s swapped them out for me at no extra cost. And of course I had to add a little bit of bling! I’ve been using this planner since the last week of December. So far I have no problems with it. 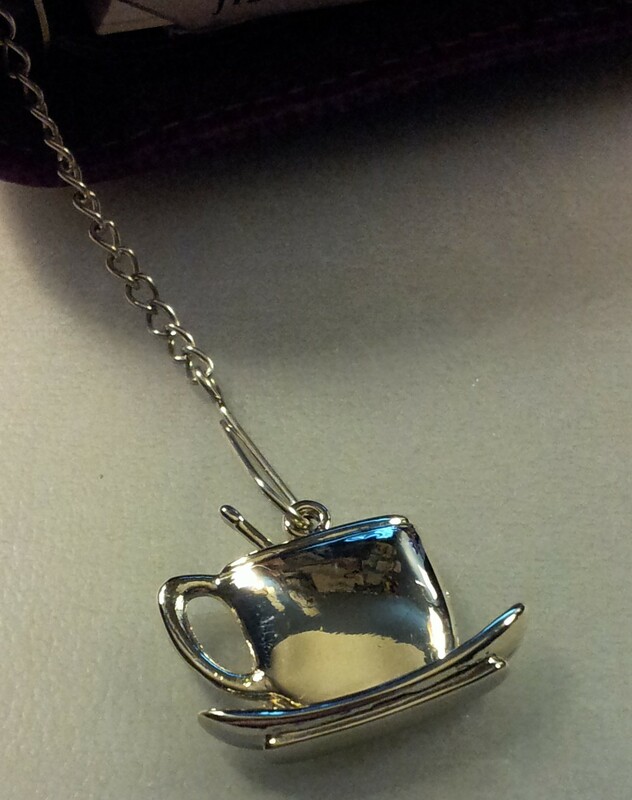 It goes in my purse with me every day. I’m quite happy with it. I’ve never been one for decorating the pages, and I don’t colour code, although I do enjoy using different colours of ink for contrast. I do like that it matches my A5, which I leave at home. The paper is not good for fountain pens and ink but that’s ok – on such small spaces I prefer the gel pens. We’ll see how long the love lasts! Love your layout, too. I’m quite looking forwards to next year, when I can really go to town and make it my own.